Caffeine is the most widely consumed drug in the world, most commonly from the beverages coffee, tea and soda. An estimated 80% of the world's population consumes a caffeine-containing substance daily. A typical 8-ounce (240-ml) cup of instant coffee contains about 100 mg of caffeine — about twice as much as a cup of tea or a 12-ounce (360-ml) can/bottle of soda. A 30-gram chocolate bar might contain as much caffeine as half a cup of tea. Pure caffeine can be obtained in powders, caplets or tablets in products like NoDoz®. The English word caffeine comes from the French (Spanish & Portugese) word for coffee: café. Caffeine has been identified in over a hundred species of plant, but the most highly cultivated sources are the seeds (beans) of the berries from the coffee tree (Coffea arabica or Coffea canephora, variety robusta), the leaves & leaf-buds of the tea bush (Thea sinensis, also known as Camellia sinensis), the nut of the kola tree (Cola acuminata) and the seeds (beans) of the fruit from the cacao (cocoa) tree (Theobroma cacao). Why caffeine is found in so many plants is a matter of speculation, but a popular theory is that caffeine functions as a natural pesticide insofar as caffeine is lethally toxic for the larvae of mealworms, mosquitos and tobacco hornworms, among others. The medicinal use of coffee by Islamic physicians probably began before the second Millennium A.D. The first documented use of coffee as a beverage was by the Sufis of Yemen, who were using the drink to stay awake during prayers in the mid-1400s. By 1510 there were coffeehouses in Mecca & Cairo. As coffeehouses spread throughout the Islamic world, their reputation for becoming places for gaming, secular music, vice and seditious political & religious discussion led to periodic prohibitions — as well as debates over whether the KORAN approves of coffee. Although the first coffeehouses opened in England in the 1650s and in Holland a decade later, the first Parisian café (coffeehouse) did not open until 1689. The Dutch introduced the coffee plant to the island of Java in 1688. The island's association with coffee production led to the use of "Java" as a nickname for high quality coffee. Brewing is the process of extracting coffea from the bean into water. Instant coffee is pre-brewed in large quantity and then dried to preserve flavor. Most of the water can be removed by evaporation, but the residual water is more difficult to remove. Freeze-drying preserved the flavor better than drying at high temperature. In 1903 an Italian manufacturer who was impatient with the amount of time his employees spent brewing coffee during coffee breaks invented a machine that used high temperature & pressure to rapidly extract coffee from grind. The result was espresso (Italian for fast). Coffee connoisseurs regard espresso to be "coffee at its very best". Modern espresso machines force nearly-boiling water through finely powdered blends of coffee at pressures of up to 15 atmospheres in less than half-a-minute. The result is an ounce-and-a-half of syrupy, fragrant, richly-flavored coffee emulsified in natural fats & colloids — containing about half as much caffeine as an 8-ounce cup of brewed coffee. Espresso topped with equal parts of foamed & steamed milk is called cappuccino. Until the end of the 17th century most coffee was produced in Yemen. By the 1950s Brazil was producing half the world's coffee and it remains the leading producer. Decaffeination of coffee began early in the 20th century. By 1985 nearly one-fifth of coffee-drinkers were consuming decaf, but the percentage dropped thereafter. There is no truth to the claim that decaf contains residual solvents (the newer methods of producing decaf use high-pressure carbon dioxide). The caffeine removed from decaf coffee is used for making soda drinks. Tea cultivation is believed to have begun in the Szechwan province of China a few centuries before the Common (Christian) Era after the Chinese learned of the plant's use by natives of northern India or Southeast Asia. Buddhist priests brought tea-drinking from China to Japan in the 6th Century A.D. The word tea in most languages traces from Chinese roots. In the 17th century the English East India Company became the world's foremost tea monopoly. Bitter feelings among Americans culminating in the Boston Tea Party may partially account for the fact that the English consume far more tea than Americans — and Americans consume far more coffee than the English. Tea contains both caffeine and tannins. Tannin (which converts rawhide into leather) is an astringent used in folk remedies for diarrhea, bleeding, inflammation and skin eruptions. Teas may be fermented (black tea), unfermented (green tea) or partially fermented (oolong). Fermenting reduces astringency, while changing color & flavor. Green tea retains polyphenols which help prevent cancer, while containing less caffeine than regular (black) tea. Use of the cacao (cocoa) bean for a beverage originated with the Indians of South America, possibly earlier than 1,000 B.C. The Spanish were introduced to the drink by the Aztecs. In sixteenth century Spain a sugared chocolate drink was consumed in a form that was strong enough to manifest the stimulant properties of caffeine & theobromine. In 1828 a Dutch chemist devised a means to remove most of the bitter fat from cocoa, neutralize the acids and create a water-soluble powder. In 1875, Henri Nestlé of Switzerland (inventor of condensed milk) helped create the first milk chocolate. As of the year 2000, Switzerland had the highest per capital chocolate consumption in the world — nearly twice that of the United States. In 1886 the Georgia pharmacist John Pemberton created a beverage flavored by caffeine-containing kola nuts and fortified by cocaine from the coca plant (Erythroxylum coca) of Peru & Bolivia. He called his beverage Coca-Cola® in honor of the plants of origin. Near the turn of the century cocaine was removed from Coca-Cola® and replaced with more caffeine. (Lithium carbonate — currently used as a treatment for mania — was not removed from 7-Up® until a half-century later.) A 12-ounce (360-ml) container of Coca-Cola®, Pepsi-Cola®, Dr. Pepper®, Tab®, Mr Pibb®, Mountain Dew® and many other soft drinks contains as much caffeine as a cup of tea. Jolt®, which has as much caffeine as a cup of coffee, is promoted as having "twice the sugar" and "twice the caffeine of other colas". For the caffeine content of common beverages see Caffeine Content of Foods and Drugs or Caffeine Content of Beverages, Foods and Drugs. The Scandinavian countries (Sweden, Norway & Denmark) and the Netherlands have the highest per-capita caffeine consumption in the world — about 400 milligrams per person per day, mostly from coffee. Caffeine consumption in the US, Canada and the UK is about half that amount — mostly from coffee in North America. In the UK slightly more caffeine comes from tea than from coffee, which means drinking many cups of tea to compensate for the lower caffeine content of the tea. Only in Ireland & Kuwait is the tea consumption higher than in the UK. In the United States coffee consumption increases with higher education & income — and is particularly high for Roman Catholics. Claims that coffee-drinking correlates with higher intelligence cannot be taken as proof that caffeine increases intelligence or that drinking coffee is smart. Lower incidence of Alzheimer's Disease (AD) among coffee-drinkers could easily be a consequence of the negative correlation between level of education & AD and the positive correlation between level of education & coffee-drinking — rather than evidence that caffeine prevents AD. 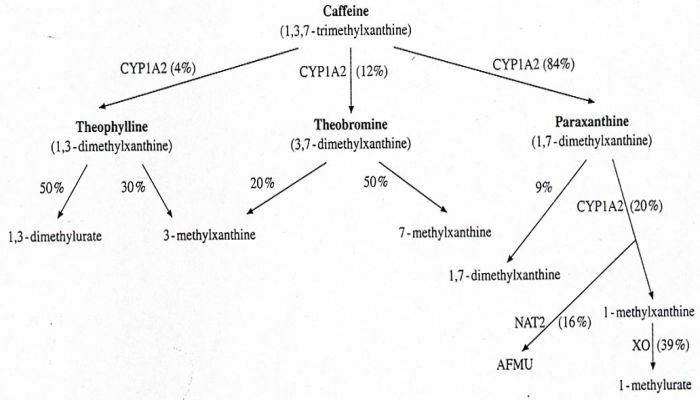 Chemically, caffeine is 1,3,7-trimethylxanthine — meaning it is a xanthine molecule with methyl groups replacing all of the three hydrogens bound to nitrogens in the xanthine ring. Caffeine is metabolized (demethylated) in the liver by CYtochrome P450 enzymes known as 1A2 (or CYP1A2). The first products of metabolism are all dimethylxanthines: paraxanthine (84% 1,7-dimethylxanthine), theobromine (12% 3,7-dimethylxanthine), and theophylline (4% 1,3-dimethylxanthine). The half-life for caffeine metabolism is typically 5-6 hours in an adult. Theophylline relaxes smooth muscles of the bronchi — and has been used for this purpose in the treatment of asthma. Theobromine from the cocao tree (Theobroma cacao), contains no bromine and is the principal alkaloid in cacao. Theobromine is a diuretic (increases urine production) that can dilate blood vessels and reduce blood pressure. By weight, chocolate is about 2.2% theobromine & 0.1% caffeine, but caffeine is seven times more potent than theobromine. In the body, xanthine is a breakdown product of adenine & guanine, the two purine bases which are key constituents of DNA & RNA. Adenine is also the purine base in the energy-storage molecule ATP (Adenine TriPhosphate) and the second-messenger molecule cAMP (cyclic Adenosine MonoPhosphate). Adenine can be deaminated in the body to hypoxanthine, oxidized to xanthine and oxidized again to uric acid for excretion. Uric acid also has anti-oxidant properties which may help to account for the long lifespans of birds & humans — but uric acid can lead to gout. Rather than being oxidized, hypoxanthine can be recycled to form more AMP, GMP or nucleic acids. Adenosine is an adenine molecule attached to a ribose or deoxyribose sugar molecule. The similarity in chemical structure between the adenine portion of adenosine and the caffeine molecule is the key to how caffeine works. Cells — including neurons — have adenosine receptors. Adenosine acts as a neurotransmitter in the brain, but is not released from synapses. The caffeine molecule is similar enough to adenine to fit into adenosine receptors, but is not similar enough to stimulate those receptors. So the main action of caffeine is to block adenosine receptors. Ethanol exerts many of its effects by modifying adenosine receptor activity. Cyclic AMP (cAMP, cyclic Adenosine MonoPhosphate) acts as a cellular signalling molecule which transmits signals from the cell membrane to the interior of the cell and to the nucleus. Cyclic AMP is quickly metabolized by phosphodiesterases, ie, by enzymes which break the diester bond (two oxygen bonds) connecting the 5' carbon to the 3' carbon of the ribose between the phosphate forming the cycle. Caffeine is similar enough to adenine that it binds to phosphodiesterases, and it can inhibit phosphodiesterase molecules preventing them from hydrolyzing (inactivating) cAMP. Practically speaking, however, this effect occurs only modestly in the body because the amounts required for a significant effect are greater than the plasma levels of caffeine acheived by coffee-drinking. More than 99% of orally ingested caffeine is absorbed — with peak plasma levels obtained in 15 to 45 minutes. Caffeine is soluble in both water & oil and can readily cross the blood-brain barrier. Caffeine potentially has pharmacological actions other than blockage of adenosine receptors, but it requires 20 times as much caffeine to inhibit phosphodiesterase, 40 times as much caffeine to block GABAA receptors and 100 times as much caffeine to mobilize intracellular calcium as is required to block adenosine receptors. Caffeine acts primarily by the direct action of blocking adenosine receptors and by the indirect action upon the receptors for neurotransmitters. Adenosine is a neuromodulator, not a neurotransmitter. Adenosine is not stored in vesicles nor released as a bolus in response to depolarization of a presynaptic membrane. Instead, adenosine accumulates in extracellular fluids as a result of cell physiology — and is therefore released from both neurons and glial cells. Adenosine is produced as a by-product of ATP (Adenosine TriPhosphate, the energy source for cellular metabolism) utilization. Adenosine actions on adenosine receptors inhibit the release of neurotransmitters. Adenosine receptors are classified as A1, A2A, A2B and A3, although only the first two are of significance for neurotransmitters because A2B & A3 subtypes are mainly located in peripheral tissues outside the brain. Accumulation of adenosine at A1 receptors on presynaptic membranes inhibits the release of most brain neurotransmitters, including glutamate, GABA, norephinephrine, serotonin and acetylcholine — the strongest action being inhibition of glutamate release. A1 receptors have highest abundance in the brain — concentrated in the cerebral cortex, hippocampus, cerebellum and the reticular formation of the spinal cord. Adenosine A1 receptors in the brain are mostly located presynaptically on axons. A1 receptors inhibit the enzyme adenylyl cyclase, decreasing cAMP levels — although significant physiological action from this effect has not been observed. A1 receptors block presynaptic calcium channels and activate potassium channels (causing hyperpolarization). Adenosine A2 receptors activate adenylyl cyclase, converting ATP into the second messenger cAMP — which can inhibit L-type & N-type calcium channels. In the brain, the effects of A1 receptors greatly predominate over those of the A2A receptors both because A1 receptors are more numerous and because adenosine has a higher affinity for A1 receptors [EUROPEAN JOURNAL OF PHARMACOLOGY 365:9-25 (1999)]. A1 adenosine receptors inhibit neural activity by both pre-synaptic and post-synaptic mechanisms. Pre-synaptic blockage of N-type calcium (Ca2+) channels reduces neurotransmitter release. Post-synaptically A1 receptor stimulation causes both enhanced Cl- influx (in a GABA-independent manner) and enhanced K+ influx — both of which inhibit depolarization. Adenosine stimulates and caffeine blocks all classes of adenosine receptors nonselectively. The general effect of adenosine in the brain is to inhibit neural activity, whereas the general effect of caffeine is to increase neural activity. Adenosine A2A receptors are prominent in endothelial cells, resulting in the vasodilation effect of adenosine (and the vasoconstrictive effect of caffeine on cerebral blood vessels — sometimes used to treat migraine headache). In the brain, only the A2A subtype of A2 receptors have significant activity, and these are primarily located in the dopamine-rich areas of the basal ganglia controlling locomotion. A2A receptor activity inhibits locomotor activity in part by inhibiting dopamine action at D2 receptors. Adenosine A2A receptors in the hippocampus are of more prominence than the illustration indicates, and adenosine action on those receptors facilitate hippocampal glutamatergic synapse transmission by opposing the tonic inhibition due to adenosine at A1 receptors [NEUROSCIENCE 112(2):319-329 (2002)], although the adenosine A1 receptor effect predominates. Caffeine's antagonism of adenosine action on A2A receptors in the globus pallidus decreases release of the inhibitory neurotransmitter GABA (Gamma-AminoButyric Acid). Caffeine can neutralize the effects of benzodiazepine tranquilizers such as diazepam (Valium®). Benzodiazepines act by enhancing the effect of GABA on GABAA receptors, whereas caffeine has an opposite effect by inhibiting GABA release. Unlike cocaine, amphetamine, morphine, alcohol and nicotine, caffeine does not activate dopamine release (to D2 receptors), in the "pleasure centers" (the shell) of the nucleus accumbens, which are associated with addiction. The "addictive" properties of caffeine seem to be almost entirely connected to withdrawal symptoms. Experiments on mice may give an indication of the effects of chronic caffeine administration. The density of cortical A1 adenosine receptors increased 20% whereas the density of A2A receptors in the basal ganglia did not change. Densities of cortical serotonin receptors increased by 26-30%, cortical cholinergic receptor densities increased 40-50% and cortical GABAA receptor densities increased 65%. Cortical & cerebellar adrenergic receptor densities decreased by 25% [CELLULAR AND MOLECULAR NEUROBIOLOGY 13(2):247-261 (1993)]. Adenosine typically accumulates in the extracellular space during conditions of fatigue — ie, when the rate of ATP utilization exceeds the rate of ATP synthesis. Adenosine accumulates in the forebrain & hippocampus during sustained wakefulness (promoting sleepiness) and decreases during sleep. During seizures, hypoxia or ischemia, accumulation of adenosine may be very rapid. In the heart, hypoxia dramatically reduces adenosine kinase activity, which also promotes adenosine accumulation. Adenosine can be increased by high levels of S-AdenosylHomosysteine (SAH) or reduced by an excess of L-homocysteine. Two physiologically distinct phases of sleep are distinguished: REM (Rapid Eye Movement) and non-REM sleep. REM sleep is distinguished from non-REM sleep by brain electrical activity comparable to that seen in wakefulness as well as by higher blood pressure & oxygen consumption. About three-quarters of sleep time is spent in non-REM. Sleep normally begins with non-REM sleep, which progresses from stages I & II (light non-REM sleep) to stages III & IV (deep non-REM sleep). About half of non-REM sleep is spent in stage II, the deeper stage of light sleep. In a typical night's sleep of 8 hours a normal person will go through about 5 cycles of alternating non-REM & REM sleep lasting over 90 minutes per cycle. Brain electrical activity recorded by an EEG (ElectroEncephaloGram) in the waking state is characterized by low voltage & high frequency. In deep non-REM sleep EEGs display high voltage & low frequency, which is why deep non-REM sleep is also called Slow-Wave Sleep (SWS). Although SWS corresponds to the lowest blood pressure, the least brain activity and the deepest sleep, SWS is the stage in which sleepwalking occurs. With long periods of wakefulness adenosine accumulates in neurons as a result of ATP breakdown. Adenosine from inside the neurons is transported across cell membranes into the extracellular space. The A1 receptors of the basal nucleus neurons are particularly sensitive to the increased levels of adenosine, which increases potassium ion influx thereby hyperpolarizing (inhibiting) those neurons. Adenosine also reduces the activity of GABA neurons in the basal nucleus, thereby disinhibiting neurons in the preoptic/anterior hypothalamus which promote Slow-Wave Sleep (SWS) [BEHAVIORAL BRAIN RESEARCH 115:183-204 (2000)]. Caffeine promotes wakefulness by opposing all of these actions of adenosine — blocking the adenosine receptors. Additionally, the neurons in the raphe nucleus, locus coeruleus and caudate nucleus are all very sensitive to the ability of caffeine to block the inhibitory infulence of adenosine [BRAIN RESEARCH 858:71-77 (2000)]. For these reasons caffeine is particularly effective in opposing the sleep-inducing actions of adenosine. Caffeine blockade of adenosine action, reduces sleepiness while also impeding learning and memory [BEHAVIORAL BRAIN RESEARCH; 193:79 (2008)]. Caffeine even reduces "sleep" in fruit flies in a dose-dependent manner [SCIENCE; Shaw,PJ; 287:1834-1837 (2000)]. Caffeine increases attention & vigilance and lessens feelings of weariness. Caffeine enhances learning in maze tests in which animals are not rewarded, but makes no difference in tests that include a food reward. Caffeine reduces the tendency to become bored by a repetitive stimulus [BRAIN RESEARCH REVIEWS 17:139-170 (1992)]. Caffeine might therefore seem well suited for those working at night, driving long hours or working with hazardous equipment — and may save lives. Ischemia, hypoxia and reperfusion can cause serious brain damage in stroke or cardiac arrest. More than half of patients discharged from hospital after coronary-artery bypass grafting show evidence of cognitive decline. Minimizing damage to ischemia & reperfusion is critically important in organ transpantation & cryonics. (For more on this subject, see my essay Ischemia and Reperfusion Injury in Cryonics.) There is much evidence that adenosine can be neuroprotective in such cases. Adenosine levels rise during ischemia/hypoxia and this effect is thought to counter the detrimental effects by providing substrate for ATP synthesis and reducing excitotoxicity through agonist actions of adenosine on A1 receptors. Selective antagonism of A2A receptors has been suggested to reduce ischemia because A2A receptors actually mediate excitation in the hippocampus (the area of the brain most vulnerable to ischemic/hypoxic damage) [BRAIN RESEARCH 705:79-84 (1995)]. Additionally, blockage of A2A receptors would be expected to cause enough vasoconstriction to reduce edema (although this could worsen ischemia). Nonetheless, the predominant effect of elevated adenosine is to protect against ischemic damage, because A1 receptors predominate in number and have greater affinity for adenosine than A2A. Not only does adenosine A1 stimulation reduce excitotoxicity by reducing glutamate release, but lower metabolism due to hyperpolarization can reduce further ischemic damage and assist in temperature reduction. Adenosine receptor drugs which selectively stimulate A1 receptors and inhibit A2A receptors — while being less readily metabolized than adenosine — would be superior to adenosine for protection from ischemia. General blockage of all adenosine receptors by caffeine worsens ischemia/hypoxia, primarily through blocking the A1 receptors. Caffeine worsens reperfusion injury from neutrophil accumulation in vascular beds — an effect normally opposed by adenosine action on A2 receptors. Preconditioning with caffeine a few weeks prior to ischemia — with caffeine discontinued prior to the time of ischemia — can reduce ischemic damage as a result of increased number of A1 receptors due to habituation/tolerance. Taking advantage of caffeine in an actual clinical/cryonics situation would be difficult because the timing of ischemic episodes & clinical death cannot be predicted — and the half-life of caffeine in a normal adult is roughly 5 or 6 hours. Unlike many other foods or recreational drugs (like alcohol or nicotine), there is little evidence implicating caffeine to cancer or cardiovascular disease — although heart disturbances can occur on high doses or in sensitive individuals. Administered acutely, moderate doses of caffeine can increase blood pressure and decrease heart rate. For most people, tolerance develops to these effects within a few days and there is no alteration in cardiovascular effects for habitual caffeine users. In a study of one hundred healthy males, 3 cups of coffee daily over 8 weeks led to a small increase in both LDL & HDL cholesterol, which would not be expected to increase the risk of coronary artery disease [JOURNAL OF THE AMERICAN MEDICAL ASSOCIATION 267(6):811-815 (1992)]. The cholesterol-raising factors have been identified as the lipids cafestol & kahweol, which can be removed by paper filtration and are not present in instant coffee [ANNUAL REVIEW OF NUTRITION 17:305-324 (1997)]. A study of nearly fifty thousand male health professionals showed no increase of cardiovascular disease due to coffee-drinking [THE NEW ENGLAND JOURNAL OF MEDICINE 323:1026-1032 (1990)] — a result in agreement with the Framingham Study [ARCHIVES OF INTERNAL MEDICINE 149:1169-1172 (1989)]. Neither caffeinated nor decaffeinated coffee are associated with an increased risk of myocardial infarction [AMERICAN JOURNAL OF EPIDEMIOLOGY 149(2):162-167 (1999)]. However, coffee in excess of 8 cups per day may aggrevate cardiac arrhythmias [ANNALS OF INTERNAL MEDICINE 114:147-150 (1991)] and raise plasma homocysteine [AMERICAN JOURNAL OF CLINICAL NUTRITION 76:1244-1248 (2002)]. Adenosine is sometimes used in emergency medicine to treat supraventricular arrhythmias [AMERICAN FAMILY PHYSICIAN 65(12):2479-2486 (2002)] and caffeine may interfere with this treatment. Caffeine equivalent to two cups of coffee has been shown to reduce heart blood flow 11% in an exercise test given to coronary heart disease patients [PLOS ONE Namdar,M; 4(5):e5665 (2009)]. In the period between the 1950s and 1970s many believed that caffeine could be a serious cause of cancer in humans because of studies in plants showing chromosome breaks, inhibition of mitosis and formation of chromatin bridges after high-dose caffeine treatment [MUTATION RESEARCH 26:53-71 (1974)]. A 1994 review, however, concluded that caffeine at the doses experienced in coffee-drinking is not mutagenic in humans, although heterocyclic amines from roasting and alkylating carbonyls in coffee are somewhat mutagenic [MUTATION RESEARCH 317:145-162 (1994)]. Nonetheless, more recent evidence does show a capacity for caffeine to worsen the mutagenicity of ionizing radiation and other carcinogenic agents through interference with cell cycle control [MUTATION RESEARCH 532:85-102 (2003)]. Green tea is reputed to help prevent cancer due to its polyphenols.The polyphenol most highly concentrated in coffee is chlorogenic acid (5-10%), but a coffee polyphenol present in lesser concentrations (caffeic acid) is associated with anti-oxidant activity. Caffeine, like the xanthine-derivative uric acid, is an antioxidant that can scavenge the hydroxyl radical which can be produced from the hydrogen peroxide in coffee & tea undergoing a Fenton reaction with metal ions [FOOD AND CHEMICAL TOXICOLOGY 29(1):1-6 (1991)]. A review of studies on animals & humans found no conclusive evidence for any increased incidence of cancer in any organ due to coffee [WORLD REVIEW OF NUTRITION AND DIETETICS 79:185-221 (1996)]. In fact, a meta-analysis of epidemiological studies concluded that persons consuming four or more cups of coffee per day have a 24% lower risk of colon cancer than those who rarely or never drink coffee [AMERICAN JOURNAL OF EPIDEMIOLOGY 147(11):1043-1052 (1998)]. Nonetheless, such an association might be due to the higher socio-economic status of coffee-drinkers rather than to the coffee. Caffeine administered acutely increases diuresis (urination), but this effect is not seen for habitual users who consume the equivalent of a few cups of coffee per day. Nor do such users typically suffer much sleep disturbance — especially when most caffeine is consumed in the morning. Tolerance to these effects is believed to be due mainly to the adaptive increase (upregulation) in number of adenosine receptors. Although tolerance is usually seen for elevation of blood glucose by caffeine, there may be little tolerance of this effect for people who are obese or who are suffering from maturity-onset diabetes. Caffeine can significantly increase the secretion of gastric acid & pepsin. But coffee — even decaf — has an even stronger effect. Apparently there is a non-caffeine component to coffee which has a significant effect on gastric secretion. Caffeine can increase plasma levels of free fatty acids, cortisol and epinephrine — effects thought to improve athletic performance. But effects on the brain may be more important for improving endurance — such as increased dopamine signalling in the basal ganglia and reduced serotonin signalling (insofar as serotonin mediates fatigue). Elevated epinephrine & free fatty acids due to caffeine may cause insulin resistance, but it remains undetermined whether tolerance can develop to this effect [DIABETES CARE 25(2):304-369 & 399-400 (2002)]. Elevation of free fatty acids (which can be twice as high as normal) due to caffeine is not simply due to elevation of epinephrine [JOURNAL OF APPLIED PHYSIOLOGY 80(3):999-1005 (1996)]. Obese women increase thermogenesis in response to caffeine to a lesser extent than do lean women [AMERICAN JOURNAL OF PHYSIOLOGY 269(4 Pt 1):E671-E678 (1995)]. Green tea three times per day can increase total basal metabolism by 4%, but this effect is more due to epigallocatechin gallate than caffeine [AMERICAN JOURNAL OF CLINICAL NUTRITION; Dullo,AG; 70;1040-1045 (1999)]. Caffeine can increase both the prevalence and severity of PreMenstrual Syndrome (PMS). Among women with severe PMS a single daily cup of caffeine beverage increased the chance of PMS by one third, whereas 8-10 daily cups increased the prevalence seven times [AMERICAN JOURNAL OF PUBLIC HEALTH; Rossignol,AM; 80(9):1106-1110 (1990)]. The consumption of fewer than four cups of coffee daily during pregnancy is not deemed to endanger the child [FOOD AND CHEMICAL TOXICOLOGY 40:1271-1310 (2002)]. For a 60 kilogram (132 pound) pregnant woman, an increased risk of spontaneous abortion is only seen for coffee consumption in excess of 6 cups per day (equivalent to 12 cups of tea) [NEW ENGLAND JOURNAL OF MEDICINE; Klebanoff,MA; 341(22):1639-1644 (1999)]. There can be considerable individual variation in the response to caffeine. People with high anxiety tend to consume less caffeine. Those who report anxiety due to caffeine usually do not report heightened-alertness, and vice-versa. People who normally consume large amounts of caffeine report more positive mood changes compared to those who consume the caffeine only as part of an experiment. Extroverts show performance improvement with caffeine when doses are large, whereas introverts show performance impairments on large doses. Caffeine can offset the effects of alcohol when the levels of caffeine are high and the levels of alchohol are low. The reversal is best for the sleep-inducing effects of alcohol, but co-ordination & performance may not improve — leaving a "wide-awake drunk". Without caffeine, habitual users experience withdrawal symptoms that typically peak the second day and are gone after the third day. Throbbing headache is the most common complaint followed by fatigue or sleepiness and anxiety or irritability. Poorly-planned studies purportedly demonstrating improved performance with caffeine have included habitual coffee-drinkers experiencing withdrawal symptoms in the placebo group. Some researchers provide evidence for the withdrawal reversal hypothesis which claims that the only benefits of caffeine on mood, alertness, and mental performance are the reversal of withdrawal symptoms on habitual users [PSYCHOPHARMACOLOGY 167:54-62 (2003)]. This result seems inconsistent with the fact that caffeine increases brain metabolism, and that there is little tolerance or adaptation to this effect (despite the increase in adenosine receptors). Heritablity of heavy caffeine use has been estimated at 77% independent of family environment [THE AMERICAN JOURNAL OF PSYCHIATRY; Kendler,KS; 156(2):223-228 (1999)].